I’m often asked about meals my husband and I can share, since he eats meat and I do not. Truthfully, we have tons of meals we both enjoy, but many of them come with modifications—cooking some chicken on the side, for example, or sautéing my tofu in a separate pan from his ground beef. This Roasted Veggies on Crusty Bread dish, however, requires no additions—I have yet to serve it to anybody, vegetarian or meat-eater alike, who finds it lacking. Or, at least, who will say so to my face. And I’ve been serving it for a long time—it’s based on a recipe I tore out of a Shape magazine back in August 2007. (I know this because I still have the page for reference). Not only is it delicious, but it’s also super-duper versatile. I’ll tell you what I use for the recipe, but I’ll also give you suggestions for other items to include. 1. Preheat oven to 500°. Mix chopped onion and peppers in a medium to large bowl with olive oil, balsamic vinegar, basil, red pepper flakes, salt and pepper. Basil should be clearly visible on the veggies. 2. Spread veggies in an even layer across baking sheet and bake for 15-20 minutes, or until veggies are beginning to brown and can easily be pierced with a knife or fork. 3. While roasting the veggies, mix your cream cheese, sour cream, and garlic—you may need to heat the cream cheese ever so slightly to make it mix easily. Cut your baguette into halves, and then cut one of those halves into vertical halves, like you would for a sandwich. To make the bread extra crusty, toast in toaster oven (or, I don’t know what you would do in a regular oven; broil?) until edges toast just a bit. Take out, spread cream cheese/sour cream/garlic mixture on each piece, and toast for a couple more minutes—you want the spread to bake into the bread somewhat. 3. 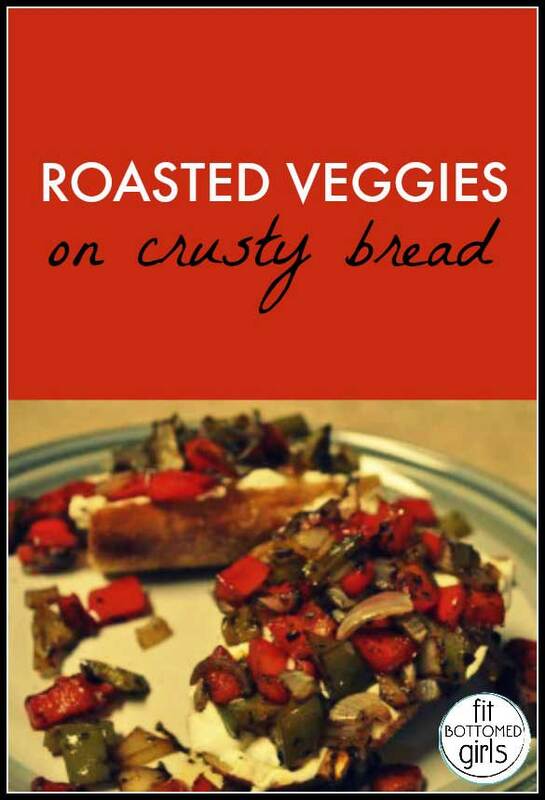 Take out bread, take out veggies, and dump the veggies all over the bread. Press them down a bit to get them to stick, but please know that this is a messy dish; definitely not a first-date food. Depending on how many veggies you used and how much you can fit on your bread, you may end up with leftovers which are delicious in wraps, omelets, pasta, you name it. Serve while warm, and enjoy! Add your own favorite veggies to this, like tomatoes, eggplant and zucchini. Don’t love basil? Switch it out with a spice you’re crazy about. It’s hard to go wrong here. And, if you’re not so concerned about the calorie count, I can say from experience that adding a little crumbled goat or feta cheese to the top is a tasty treat. While this isn’t a bad-for-you dish, you can easily cut the calories by going lighter on the oil and spread, and by using a thinner type of bread. In fact, I’ve been toying with the idea of trying it with baked, crispy Flatout Bread. Just don’t skimp on the veggies—this is an easy, delicious way to get a ton of nutrients! By subbing in some Tofutti and your favorite vegan bread, this would be a really simple dish to make vegan-friendly. Make me some, please. You can put some in a to go box next time we switch dogs. Or … I could just plop down on your couch and enjoy them there. We’ll just ensure the bees stay in their trees. Looks delicious!